Day 7 of 12 Smart Gifts: Osmo Genius Kit. Image: Osmo. For parents looking to purchase smart gifts for their children of ages 5 through 12 that are designed to educate as well as entertain, they need look no further than the Osmo Genius Kit. The kit works with an Apple iPad and transforms the tablet into a mobile hands-on learning lab, integrating the power of physical play pieces and paper with the advantages of digital feedback from the special Osmo game apps. The kit is available from the Osmo website at a special holiday price of $79. Central to the Genius Kit is the Osmo iPad Base—a smart stand that steadily supports the iPad in portrait mode—and a special clip-on reflector that redirects the iPad front camera downward to the play surface. Also included in the kit are physical Tangram puzzle pieces, Numbers tiles, and Words tiles, but the real magic during interactive play begins with the special Osmo digital games and how they integrate with those flat pieces. Designed for children of ages 5 through 12, the Osmo Genius Kit works with an Apple iPad and transforms the tablet into a mobile hands-on learning lab, integrating physical play with digital interactive feedback. Image: Osmo. The games in the kit include: A version of the ages-old Tangram game, reinvented by tying the physical puzzle pieces with digital audio and visual feedback; Masterpiece, a paper-based drawing tool with digital on-screen aids; Newton, a creative problem solving and creative game that can combine hand-drawn objects with physical objects; Numbers, which involves arranging physical tiles, including dots and digits, to create various mathematic sequences and patterns; and Words, an interactive, loosely-related-to-Scrabble game with physical and on-screen play possibilities. Many of the Osmo games can also be played in multi-player mode. 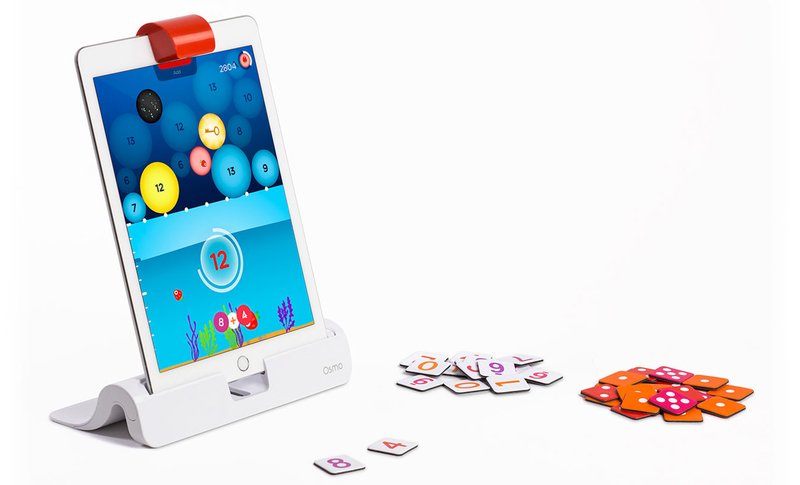 Included in the Osmo Genius Kit, the Numbers game includes physical number and dot tiles, and involves arranging them into mathematical sequences and patterns with interactive screen feedback. Image: Osmo. Most Apple iPads from the iPad 2 onward can be used with the kit, so its likely any iPad you already have in the home will probably work just fine, as long at it is running Apple iOS 8 or higher. In addition to the iPad 2, the list includes iPad (3rd Generation), iPad (4th Generation), iPad (5th Generation), iPad Mini, iPad Mini 2, iPad Mini 3, iPad Mini 4, iPad Air, iPad Air 2, and the 9.7-inch and 10.5-inch iPad Pro. If you are concerned the new Facebook Messenger Kids app might be far too much online exposure for your children, take a look at the Osmo Genius Kit for a smart, educational, and yet playfully-fun alternative. Osmo says over 25,000 schools are already using their learning tools in the classroom, and it comes as no surprise most of these games have a strong affinity to the STEM disciplines—science, technology, engineering, and mathematics.